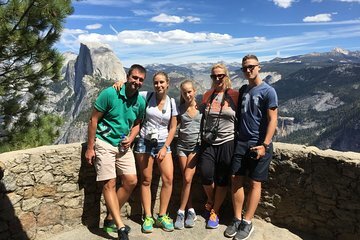 This is the perfect tour especially if you have never been to Yosemite and have limited time. We were picked up at our hotel lobby at time arranged through a call the day prior. The guide picked us up in a very comfortable Ford Expedition. There were only 2 couples on our tour so very private and personalized. Because Glacier Point is closed this time of year we spent entire day in the valley. We stopped at all the major sights and had enough time to enjoy the falls, views and take photos. Loved the early stop at Fern Spring where Mick our guide provided us plastic water bottles to fill and drink from throughout the day. There is a bit of walking but not too bad if in fairly good shape. Good hiking, or water proof walking shoes, are needed this time of year. Dress in layers as temps can fluctuate. Our guide was knowledgeable and helpful, funny with personal stories and flexible to our wishes. The lunch at the Majestic hotel dining room always be the Ahwahnee to me was excellent. It included selecting one item from salad, sandwiches and entrees plus one non-alcoholic beverage. We got to sit at the Queen's table in the end alcove with best view. Named so as Queen Elizabeth dined at this specific table when she visited. We were picked up at 7am as in hotel near south entrance. We got back at 3:30 quite tired but happy that we saw and learned do much. This tour is a bit pricey but for us so worth it as we didn't have to worry about driving, parking or how to get to each site. We learned more having a guide and enjoyed company of the guide and meeting the other couple. Yosemite is such a magnificent cathedral of nature that not having to worry about the mundane allowed us to enjoy more fully. At the end of the tour we were given an insulated tote bag-a nice memento.